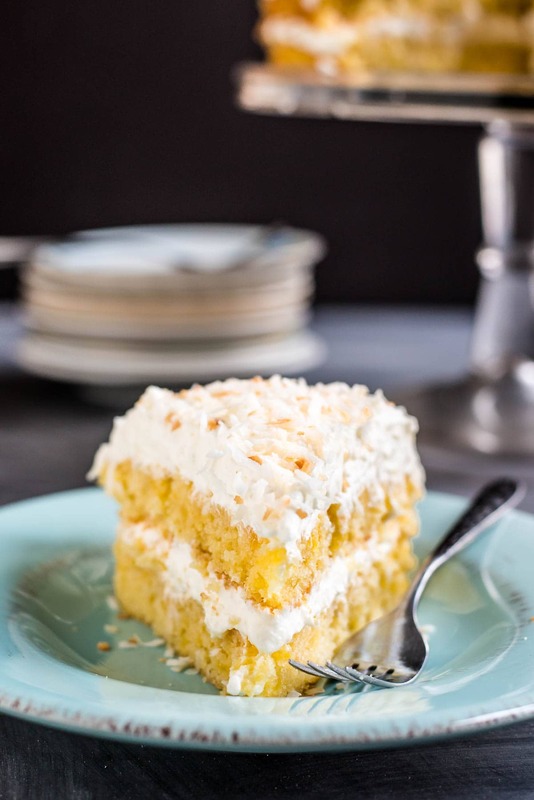 This Pineapple Coconut Cake is loaded with fresh pineapple and covered in a super fluffy whipped coconut frosting. It’ll take you right to the tropics! There is no rage quite as irrational as that of a mother towards the object, person, or pet who threatens to wake her napping baby. I am normally the friendliest of friendly persons, but if you knock loudly on the door and yell “UPS” while my baby is sleeping, I will shoot all the eye daggers at you when I open the door. The other day, while I was attempting to make this Pineapple Coconut Cake, one of our fire alarms started beeping loudly. Then our security system thought it would be hilarious to join in the fun and began harmonizing with its own obnoxious chime. So there I was, attempting to quietly drag ladders up and down the stairs and rip apart alarm systems just for one blessed hour of quiet time. I’m only slightly embarrassed to admit I almost went at one of them with a hammer. We’re just getting back from a week of beaches and sunshine, and this bright, tropical cake is the only thing easing the pain. The cake itself is packed full of fresh, sweet pineapple chunks in a classic butter cake batter. 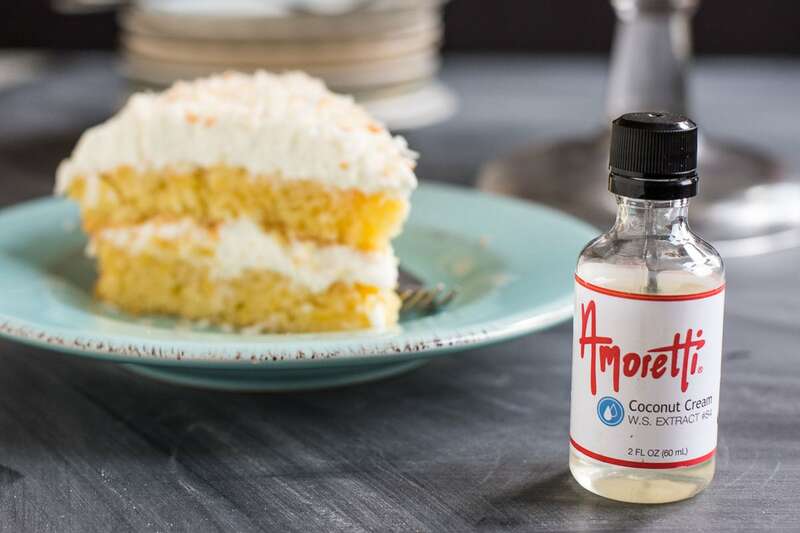 I added a little bit of Amoretti’s Coconut Cream Extract to the batter, and it made the whole thing taste like a giant piña colada. Yes, please! A lot of coconut extracts I have tried have a very fake, alcohol-y taste, but this one delivers real creamy coconut flavor. It’s very concentrated so a little goes a long way, but if you love coconut, you need this extract in your collection! Now let’s talk about this frosting. I didn’t want something too sweet or heavy, so I went for a classic whipped cream frosting with just a little bit of cream cheese added for tang and stability. It is SO. GOOD. Light, fluffy, just a little sweet, and loaded with coconut flavor. I would sleep on a bed of this frosting if I could. Instead, I piled it high on the sides and all around the cake then covered it with extra toasted coconut for color and texture. I don’t need to tell you just how lovely this would be on your Easter table. It’s bright, fresh, and springy with so much tropical flavor. Another bonus? You can definitely make this cake ahead of time and refrigerate it overnight. In fact, I found the pineapple flavor was even more concentrated the second day. So take whatever scraps of time you can muster to make this beautiful cake. It’ll be free time well spent. Preheat the oven to 350 degrees. Grease 2 9 inch round cake pans and line with parchment paper. Pour four Tablespoons (1/4 cup) of the butter into a frying pan. Add the fresh pineapple and cook over medium heat, stirring occasionally, for about 10 minutes. Remove from heat. Meanwhile, in a small mixing bowl, sift together the flour, baking powder, and salt. In the bowl of an electric mixer, beat the eggs until smooth and lighter in color. Add the remaining butter, sugar, vanilla, and coconut extract and beat until smooth. Stir in the flour and pineapple along with any juices and butter in the pan. Stir gently to combine. Divide the batter evenly between the two pans and smooth the top. Bake for 30-35 minutes until cake is browned and toothpick inserted in the center comes out clean. Allow to cool for 5-10 minutes, then run a knife along the edge and invert the cake onto a wire rack to cool completely. Place the heavy whipping cream in the bowl of an electric mixer fitted with the whisk attachment. Whisk the cream on high speed until it begins to thicken. Add the cup of powdered sugar and beat until stiff peaks form. In another bowl, beat together the cream cheese and 1/4 cup powdered sugar until smooth and fluffy. Beat in 1 cup shredded coconut. Gently fold in the whipped cream. Refrigerate for at least one hour. To assemble, layer the cakes with a generous amount of frosting between them. Frost the top. If desired, leave the cake naked, or, to better hold in moisture, frost the sides as well. The cake can be refrigerated overnight and served the following day. 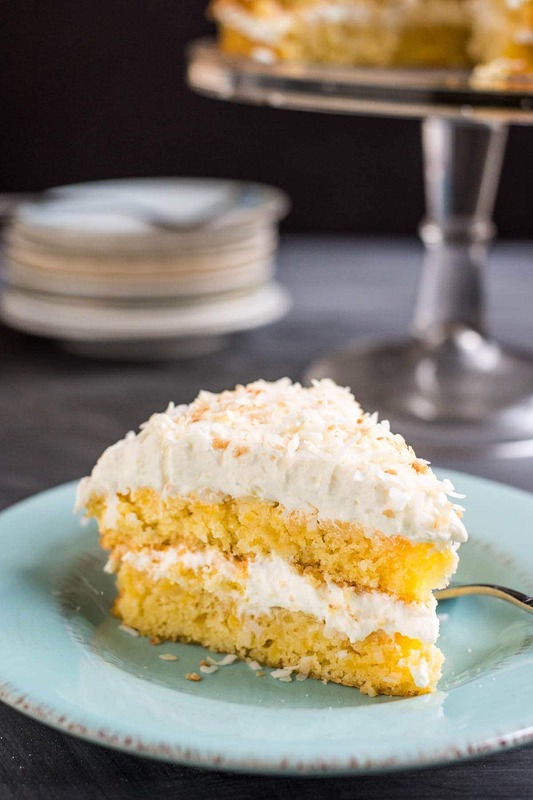 If desired, toast the remaining 1/2 cup shredded coconut in a dry skillet until golden and sprinkle on top of the cake before serving. This post is sponsored by the great folks at Amoretti. If you’d like to learn more about Amoretti’s Premium Syrups, follow them on Twitter, Instagram, Facebook and YouTube. As always, all opinions are my own. Sounds delicious! Yummy X 2!!! I’m a huge fan of layer cakes. 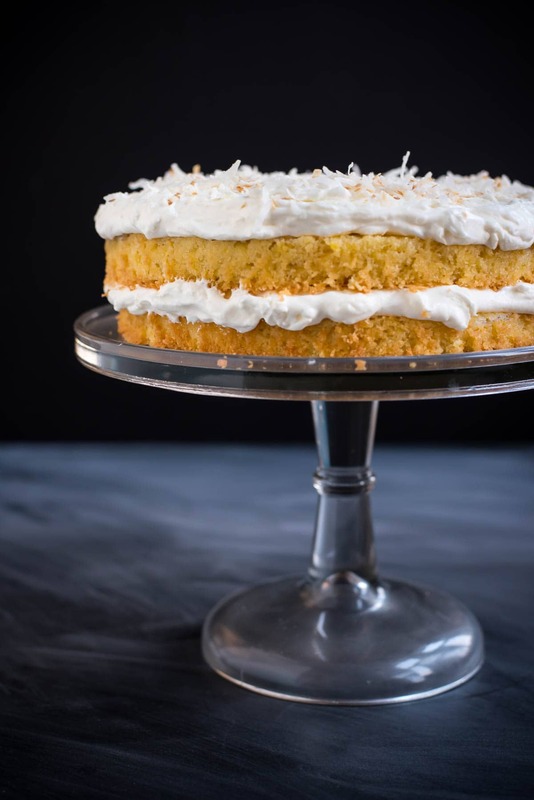 I haven’t tried a pineapple coconut cake yet – can’t wait to try this! Um, I totally understand the hammer thing. 🙂 Perfect cake for Easter! Oh my gosh, YES! All of the smoke detectors and the security system, and I swear, even the freaking doorbell are inter-connected in this house. When one goes off, they all start singing along, and it’s enough to make me go mad. And there’s no sleeping baby here, even. And seriously, some of them – I disarm them by taking out the battery and they STILL make noise. I mean, what?!? Pass me a slice of this cake, sister. So much yes! I love anything pineapple and coconut. This cake looks so moist and tender! I totally know what you mean about coconut extracts having a weird fake taste. I’ll have to try the Amoretti version. Shhh. . . but we took the battery out of our fire alarm because I couldn’t deal with it going off all the time. Nothing was burning yet it would beep. No babies but I still don’t want to hear it go off. This cake, Courtney! It’s amazing, I love these pictures and now only if I had a slice! Can you explain again the frosting?